G train of R-68 cars on the IND Crosstown Line at 4th Avenue. Photo by Zach Summer, October 2011. Four tracks, two island platforms. The tile bands are maroon with black borders and no name tablet. The station features typical IND full mezzanine extending the full length and width of the station and a crossover. There is an active tower at the south end of the southbound platform. South of the station is a two level layup area, which is also used to turn the terminating "G" trains here. Two side platforms and two tracks. Two unused express tracks underneath. Tile is yellow-orange with a brown border. The name tablet features the same colors but reversed. The station has a full mezzanine with crossover. and the platforms have a number of closed extra exits to the mezzanine. A view from the north mezzanine reveals a passageway extending further north outside of the fare control. One island platform and two tracks. The tile here is a similar color to Fort Hamilton Parkway, except it has a more orange cast. There are no name tablets; just a white-on-black caption that says "15th St". This tile band is three tiles high, which breaks the rules for IND local stations, the rest of which have tile bands two tiles high. There are vent chambers on the side walls. The long mezzanine follows the gentle curve of the station platform and features a low ceiling. Four tracks, two island platforms. This station has the same tile colors as 15th St. An unusual feature is that the brown border runs vertically through the band in spots. The top border is different than most - it is almost a full tile high. An old sign to Methodist Hospital was found. The station has a full mezzanine with crossover and center fare control. The passageway extends further north outside the fare control. On the 8th Ave. end of the mezzanine I found a storage area with old turnstiles. The south end of this mezzanine features an intermediate level between tracks and mezzanine. Local station with four tracks and two side platforms. This station is elevated along a viaduct. The station is more or less level but it enters at its south end the tunnel into the hillside of Park Slope. The downtown express track in the station has a concrete bed, not the ballast and tie bed of the other tracks on this viaduct. This better resists drips and spills from the GG train when it sleeps here between runs. West (or north) of this station is a stub-end reversing spur entered only from this station. It is level, between the two express tracks, while the rest of the line ramps up toward Smith-9th Street. Trains are rarely, if ever, stored here. The station has a crew quarters/offices structure over both platforms which is constructed of brick with evidence of covered/removed windows. The mezzanine has light green accent tile with the main tile being ivory colored. On the Coney Island-bound mezzanine we overlook the street level which features stores outside the fare control. There is a painted-over mosaic reading "To Coney Island" in the mezzanine, and a mosaic "To Manhattan" is still visible. Inasmuch as the line never went to Coney Island when it was first built, the "To Coney Island" mosaic is puzzling. Was it added after the line tied into the BMT Culver line? Was it an anticipatory sign for a future prolongation to Coney Island (like some "To the Rockaways" mosaics along Queens Boulevard)? Not sure. 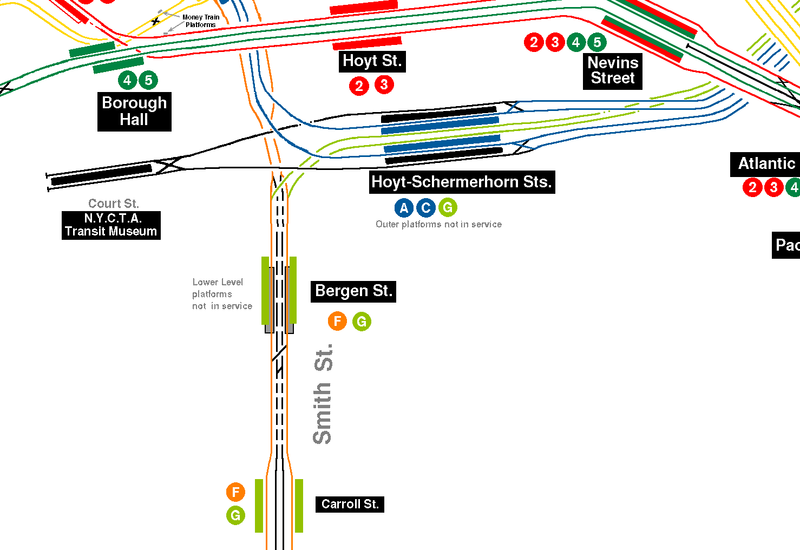 Due to the layout at the BMT 9th Street station, different stairs must be used to transfer to Manhattan and Coney Island BMT trains. R-46 "G" train at Smith/9th Street. Photo by David Pirmann. Local station with two side platforms and four tracks. It at first looks like there is some steep ramping of the tracks from Carroll Street to here and then from here down to Fourth Avenue. Actually the slope is gentle. It's the terrain that dips from the crest of South Brooklyn to the Gowanus Creek, and then rises to the crest of Park Slope. This station is the highest elevated station in the system, at 91 feet. It is so high due to now-antiquated navigation rules for tall-mast shipping in the Gowanus Creek under the station. It's the same rule that makes the Gowanus Expressway hump over the Gowanus Creek a little distance south of the station. In fact, west of the southbound platform a good view is afforded of the Gowanus Expressway, one of Robert Moses' and the Triborough Bridge and Tunnel Authority's creations. Despite the height of this station and the expressway, most of the other bridges that carry streets across the creek are low level ones. They must be opened (slid aside, lifted, swung, etc.) to let ships pass. Obviously the higher traffic of the expressway and railroad required high level crossings. This station is made of concrete, with no windscreen at the south end, just chain link fence. There are mosaics along the concrete platform walls reading "Smith-9th Street". A close examination of the canopied area suggests windows existed which were covered or removed. At the north end, the platforms afford a postcard view of the lower Manhattan skyline and the trains descending toward the Carroll Street tunnel portals. The mezzanine is reached by two flights of stairs to the crossunder and then two long escalators with an intermediate level between the escalators. The crossunder has closed windows and a closed center exit. When we finally reach the fare control we are at street level. A note about the route of the crosstown "G" train. Even the earliest maps of the IND show this route to end at Smith-9th Street. Runs to Church Avenue were infrequent. Terminating a train here is totally unbecoming of the IND mentality. From Carroll Street the G comes into Smith-9th street, dumps its riders, then moves toward 4th Avenue station. At the switchyard there it slides onto the downtown express track and takes a nap. When it's time to start the return trip, the G crawls thru the switchyard onto the uptown local track and enters Smith-9th Street, where it receives its first riders and continues on its way. The whole works around 4th Avenue is original construction, even the extra switches within the station to reverse the G train and the stub reversing track. Clearly, such a setup precluded any regular service on the express tracks right from the start of IND operations. A note about Brooklyn street names, in particular "West 9th Street". One might assume that West 9th Street was near the West 8th Street station, which in turn is near Coney Island. Not so! Yes, there is a West 9th Street in that area (but it doesn't reach Coney Island proper; it ends at 86th Street just north of the Coney Island Yards). At the Gowanus Creek the streets on the east side are numbered. Although most of them don't cross the creek, their "continuations" on the west side are given proper names, i.e. 8th Street becomes Huntington St., 10th Street becomes Garnet St., and so on. Except for 9th Street. On the west side of the creek, right next to this Smith-9th Street station, it becomes West 9th Street! In April 2013, a multi-year renovation of the Smith-9th Street Station (and the entire viaduct) was completed. The station renovation included new artwork throughout, refurbishment of all platforms and mezzanine areas, etc. Four tracks, two side platforms. The tile is forest green with a darker green border. The name tablet has the same colors but reversed. The north fare control is at platform level and has a closed wooden token booth and access via iron maiden. The south end features a crossover. Within the confines of the station the express tracks start their descent to the lower level and at the north end are at the lower level with I-beam covering. Two levels, two tracks and two side platforms on each level. The upper, active level was recently renovated. The tile here is unusual - the border has the lighter color. This border is a very light green, and the center is an equally dark shade of green. There is also dark green lower tile and splashes of light-green design interspersed at intervals. There is no crossover or crossunder, unusual for an IND express station. But the express tracks' situation here is even more "unusual" compared to other IND construction. North of this station the local, upper-level, tracks communicate with the express, lower-level, tracks by a crooked ramp. Since the beginnings of the IND the trains headed for Jay Street crept down this ramp to the express tracks. From Jay Street they crept up the ramp to the local tracks. The short distance between the two stations was slow going and not at all the way the IND should work. This, plus the combined peculiarities of the terminating of the G Crosstown train at Smith/9th, points to a primitive intent to leave the express tracks fallow. All trains were destined to work only the local tracks. The lower level is abandoned, and the express tracks from here to Church Ave. are unused. The lower platform can be accessed via sets of double stainless steel doors which, when open, reveal the stairs to the lower level. The lower level has no tile on the wall, just unpainted concrete and old lights. A look at the trackways on the upper reveals evidence the ceiling of the lower level platform. Originally, it was a twin of the upper level platforms with identical tile work, much in the style of the Nostrand Ave. station on the Fulton St. line. Iron gates preceded the large stainless steel doors now blocking access. The lower level express station actually did see some regular service for two brief periods. The first time was for eight months after the line opened and GG service terminated at Church Ave. during rush hours. During that time, the "D" train took the express tracks and stopped at the lower level of Bergen St. After that, the only time the lower level platforms were used were either due to service disruptions on the local tracks or fan trips. In 1968, after the MTA takeover, the F train took over the service from the D (which was re-routed to the Brighton Beach Line) and ran express service to and from Coney Island during rush hours. The iron gates at Bergen St. were opened for access to the F express service. The GG was once again extended to Church Ave. This service lasted for only a year. Modern MTA signage had been added to the stairwells, but the lower level only saw sporadic service due to occasional disruptions on the local track. As there were no further plans for express service, when the upper level was upgraded with its fluorescent lights, the lower level retained its incandescent lighting. Always subject to excessive water damage, the lower level platforms were permanently removed from revenue service when construction during the refurbishing of the upper level caused several weakened areas of the lower level's tile wall to collapse. NYCTA then removed the walls in their entirety. To at least keep the platforms for passengers in the event of emergency, the bare walls were painted white, signage left intact and the floors cleaned, but they never saw passenger service again. The platforms were occasionally used for storing construction materials, but they have for the most part been laid waste. The stairways behind the upper level access doors have been boarded up and sealed and the access areas themselves used for garbage collection material storage. Scenes from the 1990 film Jacob's Ladder were filmed in the lower level here at Bergen Street. There is a long scene with Tim Robbins' character riding a train of R10 cars, and then being trapped in the (now-abandoned) lower level of Bergen Street station. The director's notes on the DVD indicates that they used lower Bergen St. for filming and added extensive IND stripe and station name tile and advertising posters at time of filming. Trains heading north from here can continue on the IND Brooklyn-Queens Crosstown line to Hoyt-Schermerhorn Streets, or onto the IND 6th & 8th Avenue lines at Jay Street-Borough Hall. The "F" line service will stop at Jay Street and then continue via 6th Avenue; no service has been regularly operated from the Crosstown line to the IND 8th Avenue line. From here to Court Square, the tile colors on this line are one of three patterns. Pattern one which begins at Fulton Street is light green with medium green border, pattern two, which begins at Broadway is very light green with a black border, identical to that found at 71st-Continental Avenue on the Queens Boulevard line, and pattern three beginning at Nassau Avenue has forest green tile with a black border. Stations have two wall platforms and two tracks unless noted otherwise. Name tablets, where present have colors reversed from the tile colors. Fulton Street station features ornate vent grills in the ceiling and has a closed northern exit which has a old high wheel turnstile at the top (it is barricaded at platform level). Another closed exit has corrugated windscreen in the ceiling where the stairs once were. There is new replacement tile covering up this former entrance - a lighter shade of green with a different, darker green border. Near the center of the platform is an exit stair marked employees only. The south exit to Queens is unique for this line in that you go down to exit since the exit is located on the Brooklyn-bound side. An old black on white Fulton sign is on the center I-beams. Vent grills are present and a center fare control is fenced off. A crossover is present both ends, with the ceiling higher at the south end. The full-length mezzanine goes up several steps above this part of the station. An old sign was observed on the Brooklyn-bound platform directing customers to two Catholic schools at the Clinton end and Pratt Institute and Adelphi University at the Washington end. This station had a full mezzanine divided by the fare control. The southern portion of the mezzanine is grilled off and also closed off at platform level. This station has room for a third (center) track, built either as part of plans for the IND second system or for possible short turn trains. A close observation from the platform revealed evidence that the infrastructure for a third track exists. This station has two island platforms and a third track in the center which is not in revenue service except for service disruptions. Again, this was to be used for the IND second system. The station's full mezzanine features mosaics directing customers to either side of Bedford Avenue along with vent grills. There is no name tablet. The tile band is two tiles high, and black captions alternate "Bedford" and "Nostrand". The I-beams are painted a bright red. Leaving this station the center track splits into two and then abruptly ends. This station returns to the two track wall platform layout. The ceiling here is at least three feet lower than the other stations along the line, and the top of the station name tablet is level with the top of the two-tone green tile band. The captions alternating "Myrtle" and "Willoughby" are beneath. The I-beams are yellow ochre and show only "Myrtle" on their plaques. There is a crossunder near the station's north end. The north fare control is at platform level. A long closed south fare control and mezzanine exists (barricaded) on both platforms. The stairways to the south mezzanine are double width. Two wall platforms with an 8-degree curve. There is a closed exit to Walton Street at the north end. Observations of this closed stairway reveal a dimly lit and spooky mezzanine/crossover with no lights except for work lights. The south end fare control is at platform level with no crossover or crossunder. Entry is via a token iron maiden; exit is via a new-style high gate right next to it (see photo). This station seemed very dismal and deserted on my first visit; I did not stay too long! A second visit found it to be somewhat less forbidding, but still a lonely and desolate place. There is a closed exit to Walton Street at the north end, along with a closed crossover via the mezzanine (now used for employee areas). The second of the three tile patterns described earlier begins at this station. This station formerly had a full-length mezzanine, but now only an exit at the south end remains. There are two open stairways on each side, with four closed stairways on each platform. On the mezzanine level at the south end, a tile wall closes off the northern portion of the full-length mezzanine. Glancing through the seams between the set of double doors revealed the additional stairways and old incandescent lighting. There is a significant water problem here, and the station has stalactites dangling from the ceiling, as well as stalagmites forming on the platform surface, reminding me of the closed Canal Street Manhattan bridge line platforms. A view of the tracks reveal a deteriorating track bed with running water. There was evidence of a recent fire on the southbound platform wall. Near the far north end is a high vault over the platform which may have been part of the South 4th Street IND Second System construction. An old Subway Sun poster was found on the center I-beams on the northbound side near the Conductor's mirror, and along one of the trackside walls there is a typical IND station name tile with the name "Broadway" spelled incorrectly! The station, which is being renovated, features a bright aquamarine blue mosaic pattern in the mezzanine, and new lighting, wall tile, floor tile, and name tablets being installed. There is a police substation in the mezzanine center, the south half being closed for renovation. There is also evidence of past water damage but no standing or dripping water could be found. The I-beams are painted bright cherry red. The captions alternate "Metropolitan" and "Grand", with the former being prominent on the tablets. There is also evidence of at least three removed stairways. The south exit has been closed, with the the stairs from the platform behind floor to ceiling gates at platform level. This station starts the third tile pattern described earlier. The station name captions sit right beneath the tile band with no white tile separating them. There is also a unique crossover at the south end: there are passageways both inside and outside the fare control (see photo). A green mosaic sign directs passengers to the appropriate platform. North fare control is at platform level and the south fare control is eight steps up. There is evidence outside the north fare control of a removed old style wooden token booth. This station and has a crossover at the south end and platform level fare control at the north end. Directional mosaics "to Brooklyn" and "to L. I. City and Jamaica". The white-on-black station name captions are abbreviated "GREENPT" rather than having the full name spelled out; possibly due to the length of the name "Greenpoint" and the fact that the tile band is staggered in places - the caption would not have fit there. Like at Nassau Avenue, there is no white tile separating the forest green tile band and the captions. There is a section of lower ceiling at about the midpoint of the station platform. A sign in the mezzanine advises of both Hoyt Street and Church Avenue destinations. This station has forest green tile with no name tablet, simple "21" captions (no mention of "Van Alst") and one center island platform. The station at one time had a full mezzanine but the north half of the mezzanine is now closed by railings and plywood. Center exits and a south exit have also been closed. There are three removed stairways. A spring of mineral-water can be seen bubbling through the tile on the southbound track side; there is also standing water in closed-off parts of the mezzanine. A train route selector panel was observed at the south end of the southbound track. This station is currently the last stop on the Crosstown line. It has an island platform, forest green tile and no name tablet. A new tower is at the south end of the southbound platform. The station had a full mezzanine but the north end is now closed. A passageway on the west side leads to the "E" and "F" trains at 23rd Sreeet-Ely via Citicorp Center's underground passageway. At one time the Crosstown train went to 179th Street during overnight hours but has been gradually reduced to the present Court Square as "permanent" terminal.